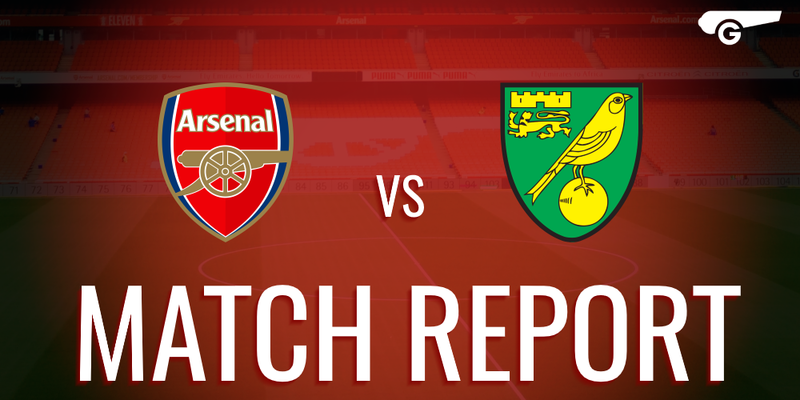 The win against Norwich was a very important three points for us. With City to come next weekend, winning our last two home games has become a an absolute must and while Saturday's game was far from a classic, we have at least achieved part one of this task. Manchester United have a game in hand on us, so while we might be seven points clear at the moment, it could be just four by the time we lineup against City. There is still work to be done. Despite the 0-0 disappointment up at Sunderland, there was no change in personnel for Arsenal, as Giroud continued up front and Elneny kept Coquelin on the bench again. There was a change amongst the substitutes though, with Cazorla making a welcome return at the expense of the rather unfortunate Joel Campbell. To be honest, the game was pretty poor. The simple fact is that this group of players is at a very low ebb and are completely devoid of confidence. The ponderous way we come forward, lacking conviction and impetus smacks of a team that isn't sure of themselves. We do create chances and half chances, so the talent and the potential is clearly there, but the team just looks so full of doubt that they've lost their cutting edge. I think they're as much in need of a fresh start as the fans are. The winning goal was very sweet for me and a lot of others because of the players involved. Wenger's decision to substitute Alex Iwobi instead of Olivier Giroud resulted in a chorus of moronic boos, like a spoiled teenagers who got the present they wanted, but not in the right colour. Thankfully, Giroud put them to shame by coolly setting up Danny Welbeck (the player who'd been brought on) to smash home the only goal. When stuff like this happens, it's hard not to agree with Wenger that the Emirates is a 'difficult atmosphere'. How will loudly booing Giroud have any positive effect on the team or the player? Remember that whilst they're paid a lot of money to perform at the highest level, the players are still human beings and no matter how much money you're being paid, 50,000 people booing you and calling you useless is going to affect your morale. I don't imagine players are going to be rushing to join the club if they know that a few poor performances will lead to abuse from the stands. 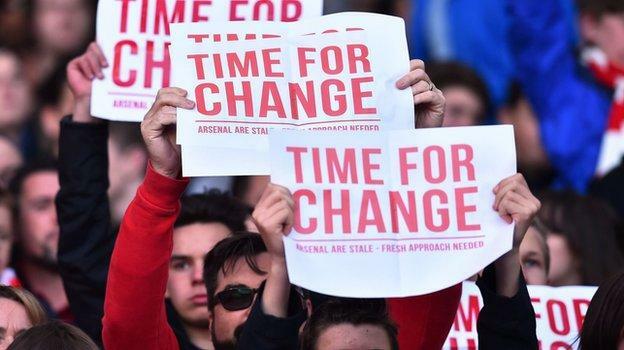 Obviously the planned protest got a lot of attention in the build up to the game, as REDAction, the AST and the Black Scarf AFC groups urged fans to print off A4 sheets with the very British 'Time for change - Arsenal is stale - Fresh approach needed' emblazoned on it. The papers were supposed to be raised on the 12th minute to signify the 12 years since we last won the title. However, when it came down to it, participation was very limited and met with a lot of boos. Rather wonderfully, it also inspired a large rendition of 'One Arsene Wenger' and it was very clear that there were many more singing the manager's name than holding up the A4 sheets. Here's the thing, this protest was half-baked and disorganised. I'm not entirely sure how you can expect to send out a few tweets out a couple of days before the game and expect the whole stadium to display some massive A4 mosaic. I think in this case these groups have vastly overestimated the power of Twitter and other social media outlets. In particular REDAction have been having a tantrum about 'apathetic' fans not getting involved and not being arsed, which I've found pretty distasteful. The reason the protest wasn't successful was because the vast majority of fans didn't want to be a part of it and you can understand why. I'm sure a lot of people will have seen the shocking video of a group of fans chanting about wanting Arsene Wenger to die before the game. 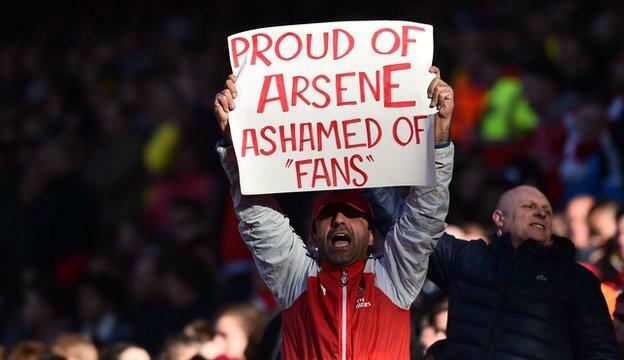 I simply cannot understand how anyone could get into a state of mind where they think that's acceptable in any way and to be honest if I had to change one thing about the club, I'd much sooner oust those fans than Arsene Wenger. In fact I hope the club is aware of the video and considers taking some action against these cretins. Now I'm obviously not blaming the fan groups who organised the protest for a small minority of idiots, it's 100% not down to them. But the wider issue is that this protest had no real unifying goal. 'Time for change' can mean a lot of things, players, managers, coaches and 'A fresh approach needed' is similarly vague. Whilst a lot of people, myself included, think something needs to change at the club, there's no real clear consensus as to what. It's difficult to unite a large group of people when there are so many different opinions on what the problem is. Whilst I applaud REDAction for wanting to make a difference, a few tweets and some A4 posters isn't going to cut it. Finally though, I'd like to give a quick middle finger to the journalists and those in the media who mocked the protesting fans and labelled us as 'spoiled little rich kids' (looking at you Ollie Holt). These are the same people who have attacked Arsenal for years and years about accepting mediocrity and not getting rid of Wenger, but suddenly we're ungrateful scores who don't understand how lucky we are? Shove your hypocrisy. There are but two games left to endure people and then we can forget about Arsenal's failures and get upset about England's. Try not to top yourselves and just cling on to the faint hope of catching Sp*rs for second place.